“You know these muscles from surfing” breathed Bee, our lean-limbed yoga teacher, as we lay face forward on our tummies, arching from the smalls of our backs in Cobra pose. “Hear your breath,” she soothed, as she padded round the room and adjusted our poses. This was no ordinary yoga studio. A small class of eight students, we were stretched out on our yoga mats in a roof-top shala (yoga house), overlooking the Atlantic Ocean. At the front of the studio, wall to wall mirrors were replaced by a sliding glass wall, which was pulled wide open to give uninterrupted sea views. As I wobbled into Warrior One, I fixed my gaze on the solid blue horizon, watching the Moroccan sunset as it reflected paprika-red beams across the water. 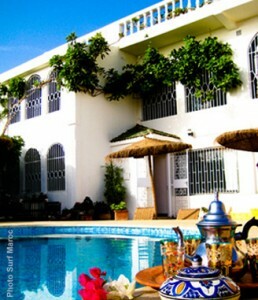 Surf Maroc set up their first surf camp on Morocco’s Atlantic coastline back in 2003. Just 20 minutes from the international airport at Agadir, this stretch of shore is blessed by year-round Atlantic swell, with every bit of coastline known for its beach, reef or point breaks; and, whether it’s winter’s barrelling waves or summer’s calmer waters, Morocco appeals to all levels of surfer, from first-timers to seasoned pros. But six years ago, English founders, Ben and Ollie, decided to establish a different type of surf sanctuary, and opened ‘Villa Mandala’ a dedicated retreat for surf and yoga breaks. Running every fortnight from March to December, guests at ‘Mandala’ book in for week long retreats, and indulge in daily yoga sessions, surfing and healthy meals. A ten minute drive from Surf Maroc’s original surf camp in Taghazout, Villa Mandala sits on its own stretch of beach, just outside the small town of Aourir. ‘It just an amazing place to run these types of holidays’, Ben told me. 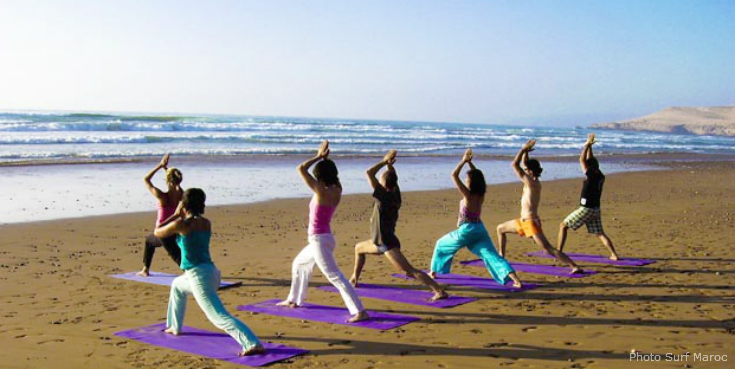 ‘The quiet location is great for yoga enthusiasts and the beach-front setting provides the perfect surf spot’. Plus the proximity to Aourir and Agadir mean you can easily immerse yourself in the cultural beat of Moroccan life, get lost in the souks or venture out for an evening, if you feel the urge. I arrived in Aourir on market day, when the road to the villa was bursting with a kaleidoscope of colourful spices, kitchen-ware, textiles and tat. Bursting through the hub-bub, I emerged onto a typical North African beach – backed by scrub and with a distinct, rugged charm. At one end of the beach, stood Mandala Villa subtly looking out to sea, its entrance gate shrouded in deep-pink Bourganvilla flowers. As I walked through the gates, I entered a modest sanctuary. The villa’s ocean-front terrace and pool area lead past an alfresco dining area and into the main house, where a communal dining room and lounge are bedecked in Moroccan textiles and big sofas. Its nine bedrooms occupy a maximum of 21 guests, so the atmosphere at the villa can always be relied on to be congenial yet calm. Mandala Villa even has its own private steam room for post-surf detoxing, or you could nip into Aourir for an authentic Moroccan hammam and get scrubbed and scoured, creamed and cleansed by Moroccan masseurs. Carry on up to the top floor of Villa Mandala, and you arrive at the stunning yoga shala and sun terrace: the sea views and sense of calm here are hard to beat. ‘We added the shala to make Mandala the perfect venue for Yoga & Surf Retreats’, Ben told me. For most guests at the villa, days begin and end here in the shala, with morning yoga to waken the muscles ready for surfing and restorative evening sessions to stretch and relax them afterwards. Surfing takes place all along the coastline here, and Surf Maroc’s experts can either drive you to the best spots each day, or they offer beginner surf lessons, where you’ll learn wave theory and surf etiquette, as well as find out how to ‘pop up’ and ‘get on the green’. Whether you’re an experienced surfer searching for great waves; a first-timer looking for a chilled place to learn; or an impartial individual seeking to balance mind, body and soul as well as get a cultural fix, Villa Mandala won’t disappoint. My last day in Morocco was one of mixed feelings. Elated at having caught my first green wave yet melancholy about going back home to work; super-stretched from my daily yoga sessions yet sore and sunburnt from spending a week in the water, I saluted the sun one last time and prepared for savasana (relaxation), in my final yoga session. “Listen to the silence between the waves,’ Bee breathed, as a salty breeze flapped at the muslin curtains of the shala, “Hear your breath merge with the ocean”; she whispered, as she massaged our necks with lavender oil. I think I’ve just found my happy place, I thought to myself, and vowed to book in for another week.